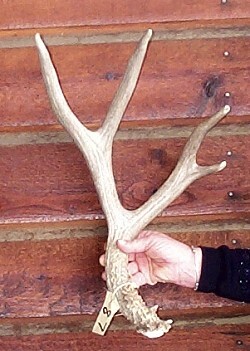 Big, non-typical antler. Picked up in 2009 out of water, but I THINK it is a 2008 shed, could be 2009 due to the water. Great craft or display antler. 21" straight line from burr to back tine. 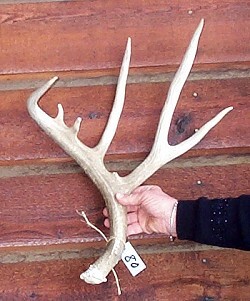 Very big, fresh light brown 2009 antler. Great craft or display antler. 24" straight line from burr to back tine. 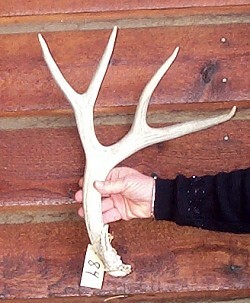 Very nice faded antler. Smooth crack free white one side, faded brown on other. Great craft or display antler. 18" straight line from burr to back tine. 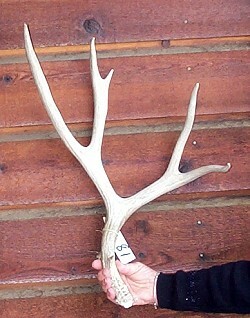 Nice light brown 2009 antler. Great craft or display antler. 16" straight line from burr to back tine. Big, light brown antler. Picked up in 2009, but believe it is a 2008 shed. 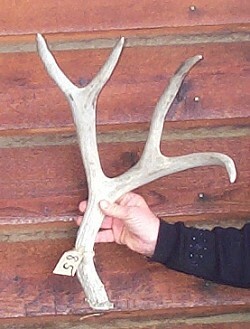 Great craft or display antler. 20" straight line from burr to back tine. 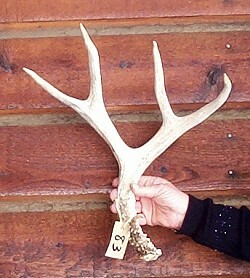 Big, massive dark brown 2009 antler.